By default there is no Run command in Windows Vista and Windows 7. 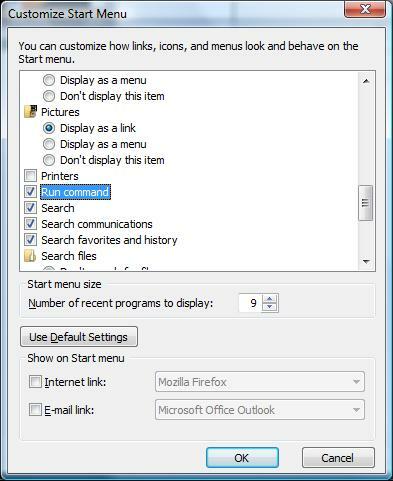 If you want to display it back, you can from the Start Menu Option. How? Follow these easy steps. 1. 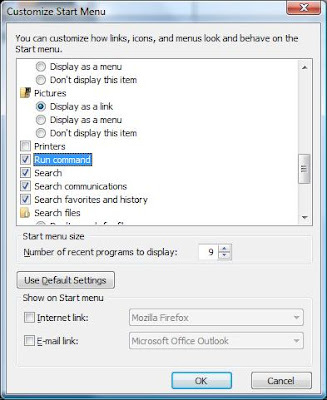 Right-click on the taskbar, choose properties, then select Start Menu tab. 2. Select the Start Menu option box then click the Customize button. 3. From the Customize dialog, scroll down until you see the option named "Run command". Check it to enable the feature then click OK to apply changes. 4. Close other dialogs by clicking OK buttons. You should be able to see now the Run command on Windows Start Menu.